Now I know some people love it. But I’m a bit rubbish at it. And all those sleeves and collars and cuffs stress me out. And I reckon hating it, is why we’re so tempted by ironing products. And end up with ironing clutter. Somehow “stuff” will make it easier. But honestly? It doesn’t does it? 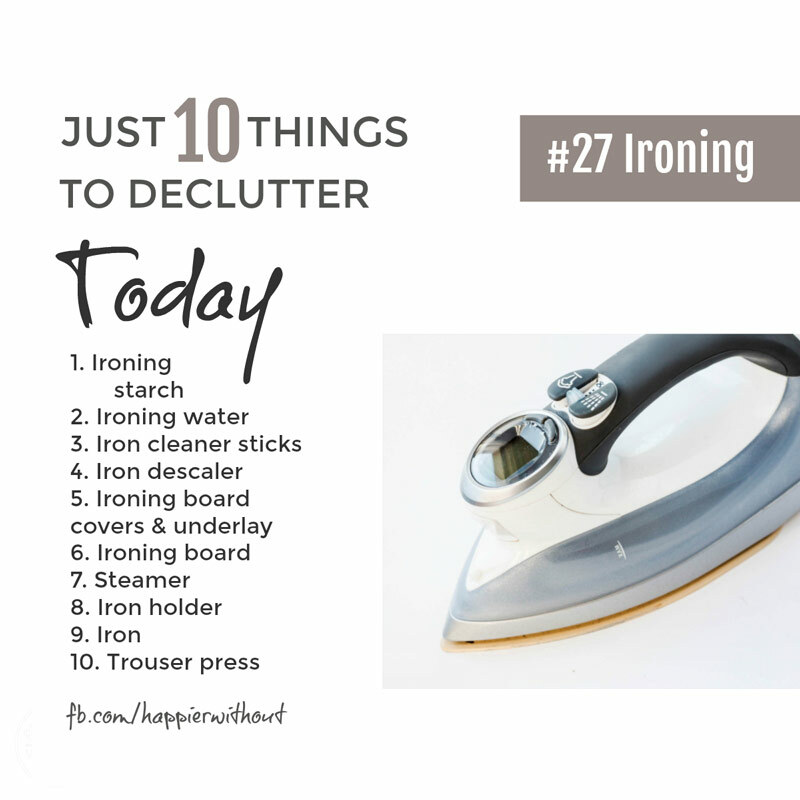 So today we’re looking out for ironing clutter we don’t use and letting it go. Doing my ironing declutter I let go of an iron holder, a raggedy old cover that didn’t fit the board and a mini board – broken – for doing sleeves! I hadn’t use them in a good 5 years. And they jammed up the laundry cupboard. I must have shifted them out of the way a thousand times. BUT still held onto them. And this is the weird thing about clutter. It gets in the way. Loads. BUT kind of becomes invisible. We just accept the hassle. And don’t think to let useless stuff go. AND that’s why I love these little daily declutter lists. They really open our eyes to all the random bits and bobs taking over our homes that are actually easy to let go! Letting go of easy stuff, helps us let go of big stuff later. So well done for anything you let go today. I’ve talked about the marketing machine before. And how it convinces us to buy stuff. So we end up with a zillion little used products. Especially when that one IS white vinegar. I will almost never tell you to buy anything. BUT white vinegar you should. It naturally cleans and disinfects everything from dishwashers and washing machines to hard water scum in the bathroom.